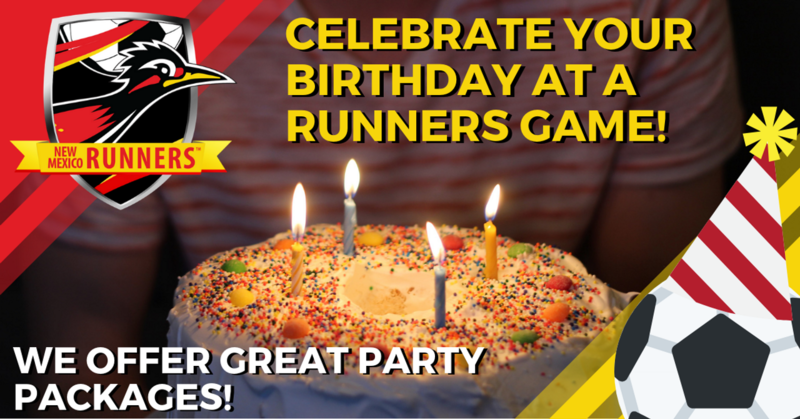 Celebrate Your Birthday With The Runners! What better way to celebrate your child's birthday than with a birthday party at a New Mexico Runners Arena Soccer game! We offer 2 options that fit any budget! A Runners t-shirt for the birthday child. Your birthday will receive a shout out by the announcer during the game. For more information, call us at (505) 663-7RUN (7786) or Email New Mexico Runners. 15 Party Box VIP Tickets on the floor against the field. Water and other beverages in a personal cooler. Your group will have the opportunity to take part in our Runners Fan Experiences including a locker room tour and come on to the field to meet the players during warm ups!